WASHINGTON — On Valentine’s Day, Tori Gonzalez was photographed at Marjory Stoneman Douglas High School grinning, wearing a red sweater and holding a little pink bag with a candy rose in it, a present from her boyfriend Joaquin Oliver. By the end of the day, Oliver was dead, one of 17 victims of a mass shooting that galvanized a youth movement to end gun violence in schools. On Saturday, Gonzalez was among hundreds of present and former Marjory Stoneman Douglas High School students who made the trip to Washington for the youth-led March for Our Lives rally to protest gun violence, organized in the weeks following the shooting in Parkland, Florida. The Stoneman Douglas contingent was joined by thousands of students from across the country who rallied in D.C. in solidarity, saying they were fed up with the routineness of lockdown drills and active shooter threats. There were also more than 800 sibling marches that took place on Saturday across the U.S. and in countries across the world. Among the most powerful presenters was Emma Gonzales, a Parkland survivor and organizer, took to the stage to deliver a speech, and then sat down, and remained in silence. She wanted to be on the stage for 6 minutes and 20 seconds — which was the same amount of time the Parkland gunman’s rampage lasted, kill 17 people. There were also performances and appearances by celebrities like Ariana Grande, Common, and Lin-Manuel Miranda. People from around the country said they’d been inspired by the Parkland students to make the trip to D.C.
Natalie Kincaid, 14, had traveled from Raleigh, North Carolina, with her grandmother Melanie Pope and her grandmother’s partner, Mary Jennette. “I think we need stricter gun laws,” Kincaid added. Gun control measures like universal background checks and an assault weapons ban were common themes expressed by the marchers. 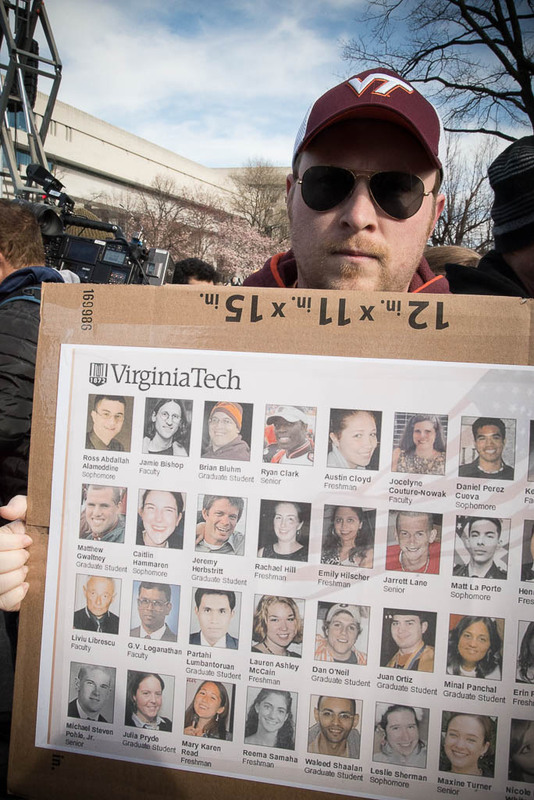 Jason Walters, a 32-year-old federal government worker, held a sign showing the victims of the 2007 Virginia Tech shooting. Walters hopes that the renewed energy around the gun control debate means that something may actually change. 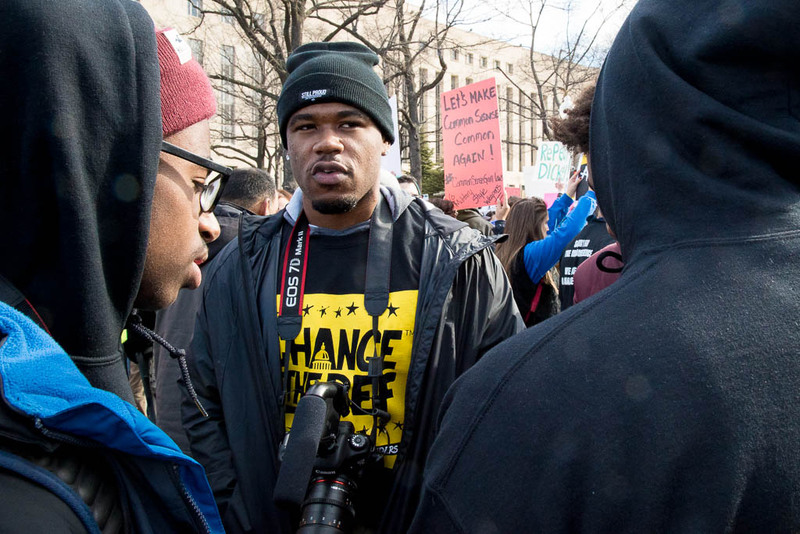 “I’ve been optimistic before, but I hope this time things will be different,” he said. 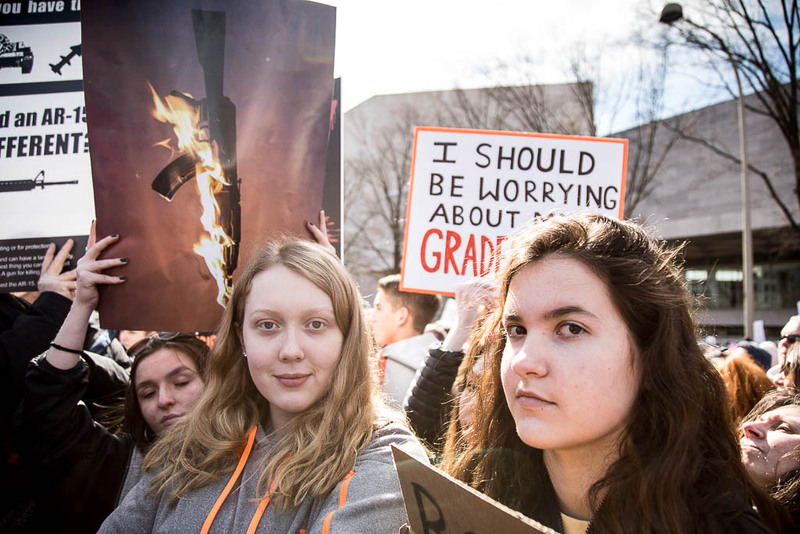 Teachers were also a visible presence at the march, many of whom toted signs criticizing the Trump Administration’s support for the idea of arming school staff as a means to improving school safety. Nancy O’Leary, a 59-year-old math teacher from Montgomery County, Maryland, was holding a sign that said “Armed math teacher < AR15.” O’Leary said she’s not the only one among her colleagues who isn’t thrilled about the idea of arming teachers to prevent future school shootings. Throughout the day, past and present students at Marjory Stoneman Douglas marched to cheers from the crowd. “There are no words for how empowering this movement has been,” said Dominique Francis, 29, a social worker and former student at Marjory Stoneman Douglas High School. McCooty said he’d known Oliver since they were about three — they met after Oliver and his family emigrated from Caracas, Venezuela. They shared a love of basketball and video games. Tori Gonzalez hopes that her boyfriend Joaquin Oliver will be remembered by the positive changes to come, and was wearing a t-shirt emblazoned with a slogan from an organization his parents set up that aims to empower and educate young people about engaging in government.